We’ve been blogging about Tamil Nadu for some time now, and with August nearly upon us and a spate of birthdays to celebrate (including my father’s 90th) we are calling a halt for a month. We hope very much that you’ve enjoyed sharing our passion for south India – please tell your friends and let us know what you’d like to hear more of. 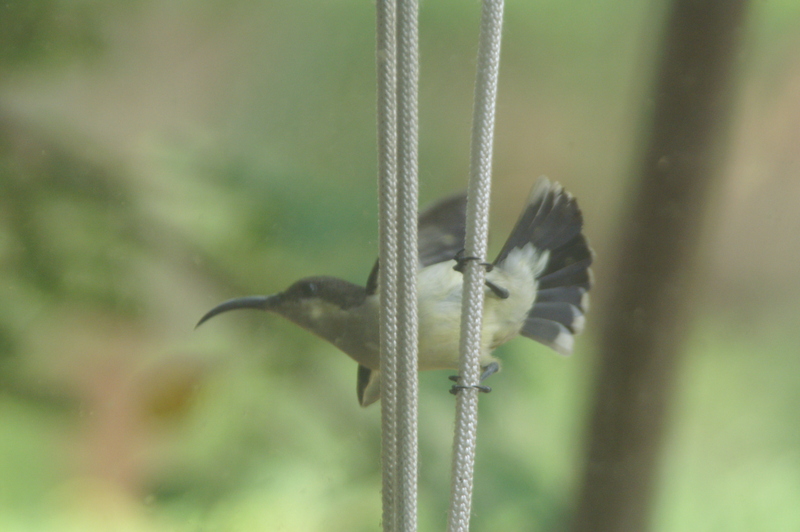 Here are a few snaps to round off, taken in the garden at the cottage (or from it). 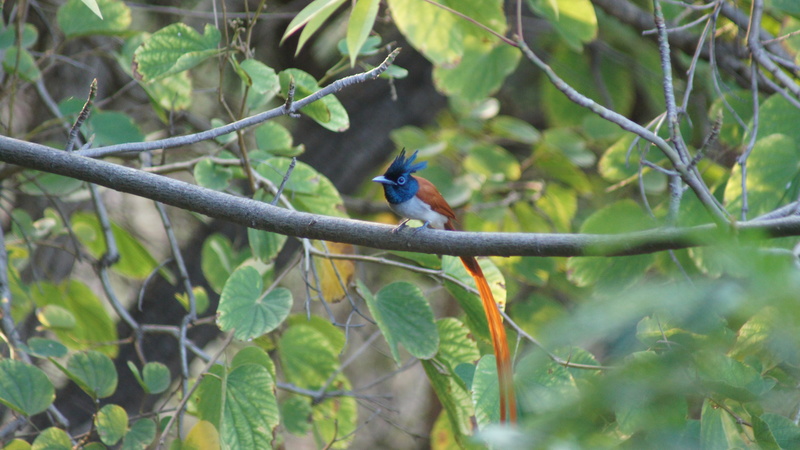 The really excellent one of the paradise flycatcher was taken by our friend Sanath Roy – look out for his blog on WordPress too. This entry was posted in Culture and tagged South India, Tamil Nadu on 29/07/2013 by Tailored Eco-Tours. 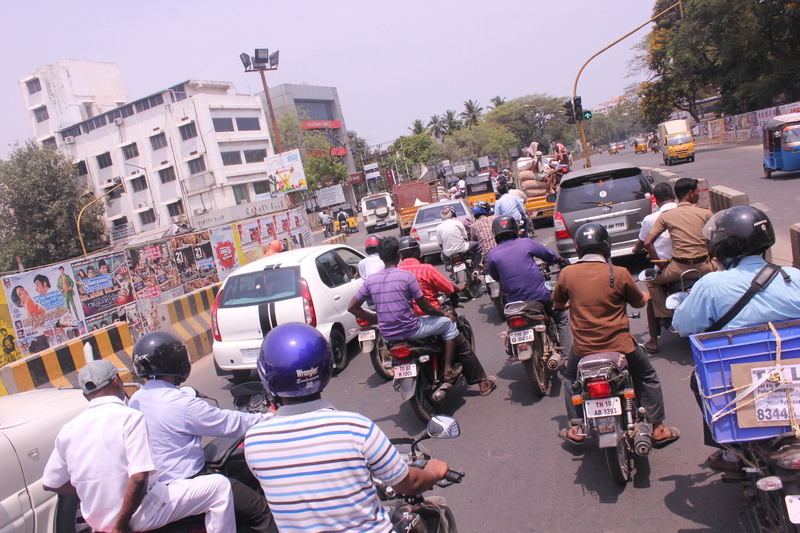 It will be a disastrous day for south Indian roads when every motor-bike owner successfully aspires to own a car! Mind you, the launch of the Tata Nano, retailing at the time for one lakh rupees (R100,000) – around £1200 – was supposed to entice the motorcyclists away from their bikes, but you don’t hear so much of it these days. Bikes are the transport of everyman, and carry everything. Tamils are a slender race, so three men fit easily onto a bike – and often do. Four men is feasible but a bit of a squeeze. Two men, with the passenger carrying something across their knees, is normal – I haven’t the photographic evidence, but I have seen any amount of amazing baggage – a goat, a small calf, a mattress, a bicycle, and once a large sheet of plate glass, which was really scary. Bikes can be retro-fitted with a metal frame to carry six gas cylinders, for delivery down the small side lanes; bikes like the one in the photo are used rather as a donkey would be elsewhere. Our local milkman comes up the road each morning to the man with the buffalo herd carrying a huge churn and also the man to do the milking. But it is as a family vehicle that the bike reigns supreme. I definitely remember seeing an advert from the family planning people recommending that Indians restrict themselves to two children. One very good reason, they said, is that “the whole family can then easily be carried on a bike”. The man drives with the older of the children sitting in front of him; the woman rides side-saddle behind with the baby on her knee (or when the second child gets a little older, between her and her husband’s back). I should perhaps mention that all Indian bikes are fitted with a sari guard over the rear wheel, to avoid tangles. This entry was posted in Culture and tagged South India, Tamil Nadu on 21/07/2013 by Tailored Eco-Tours. I have just spent the weekend visiting friends in Bangalore, which involved a pleasant and varied drive up highway 7 from Dindigul. NH7 is apparently the longest road in India, at 2369km, and one day it would be fun to start at Kanniyakumari and take it all the way through Tamil Nadu, Karnataka, Andhra Pradesh, Maharashtra, Madhya Pradesh and Uttar Pradesh, to end at the Hyderabad Gate, at the entrance to Varanasi on the Ganges. My journey was less than 400km. I started on the wide plains of the upper Cauvery delta, where the wind was extremely strong and many new wind farms have been constructed. The landscape is dry – red sandy soil and acacia bush – and bare rocky strangely-shaped mountains rise a thousand feet or so out of the plain. Suddenly, however, you hit a green belt – the area irrigated by the Cauvery river. 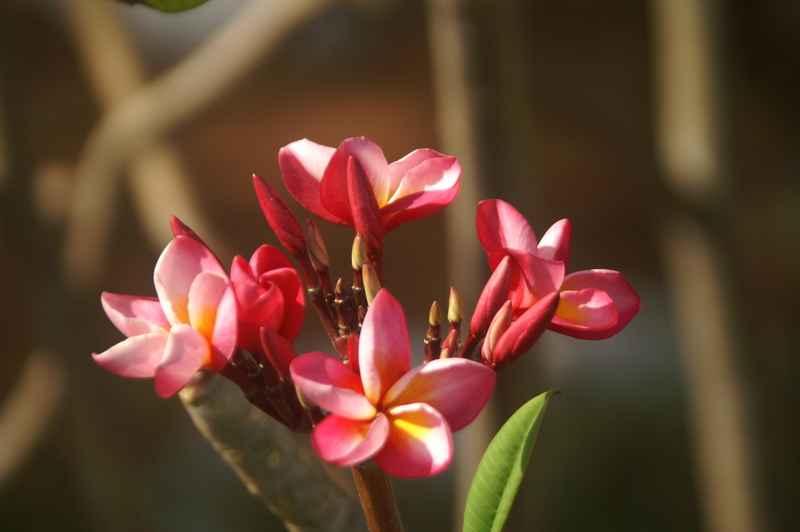 Dense plantations of banana and coconut line the highway, and along the river itself are a number of temples. The hills then start to appear – medium-sized hills covered in bush through which the road winds on its way to Salem. 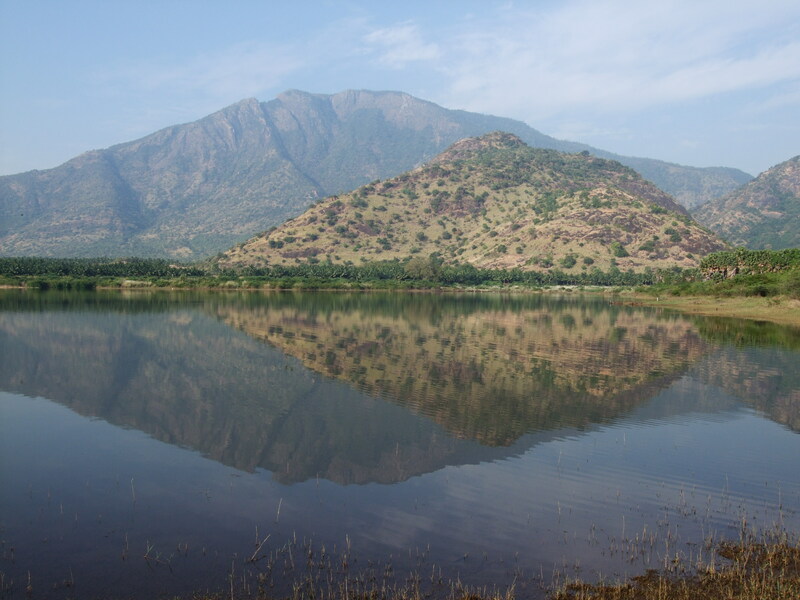 To the east are the Kolli Hills, or Kolai Malai – relatively unspoiled ranges rising to four thousand feet or so. I have not visited them, but the entry in Wikipedia is quite enticing. Salem, on the other hand, is not enticing at all, though it has a famous history and is strategically situated where a number of important routes come through the hills. The city has expanded to take in the ring road, so traffic is fairly nightmarish and it took me 30 minutes to struggle through. North of Salem, the road soon reaches Thoppur and then abruptly climbs several hundred feet up to a new level. Monkeys – the common-or-garden ones which you see at the side of the roads in all the forested areas, not the more attaractive langurs, which stay on the hillsides – are everywhere and stopping for a quiet picnic was impossible. Motorists will insist on flinging food out of the windows. From Thoppur, through Dharmapuri and on to Krishnagiri, the scenery gets wilder again and the hills more bizarrely shaped. Some are mere piles of boulders which look as though they are ready to tumble; others are smooth cones of granite; some have sheer faces; the accessible ones may have a shrine or a small temple on top. In between are paddy fields whose vivid green makes a stark contrast to the red soil and grey rock. 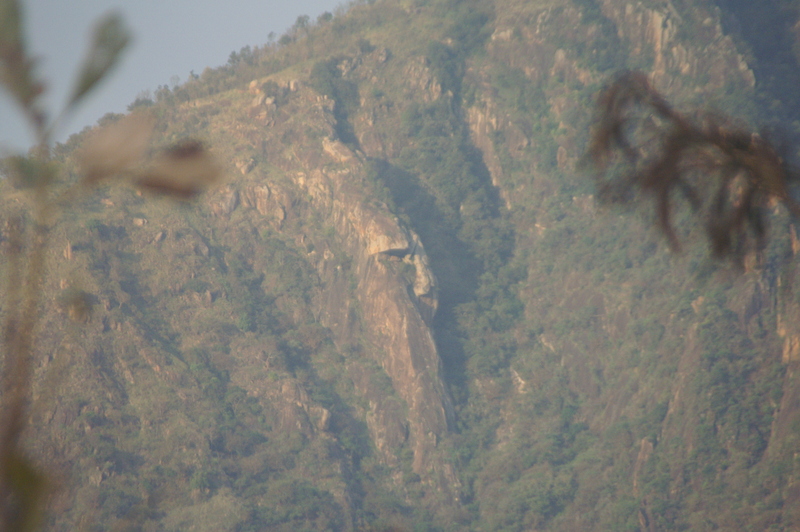 At Krishnagiri itself, a huge rock with a Vijayanagar Fort towers over the town. Then comes the final leg. The traffic from Chennai has joined us at Krishnagiri, and the Highways Authority are busy widening the road to 6 or 8 lanes and putting in a number of flyovers. You can imagine the scene. The road climbs to three thousand feet in a series of gentle curves to reach the plains around Bangalore, and around 40km south of the city centre, you enter an urban landscape. With no rain yet, and continuous construction, it was all a bit dusty. I am sorry I don’t have any photos of the trip – I was busy driving and needed at least two hands. But I hope you enjoyed the description. This entry was posted in Environment, travel and tagged South India, Tamil Nadu on 17/07/2013 by Tailored Eco-Tours. The dreadful floods and loss of life reported from Uttarakhand have drawn attention to the onset of the 2013 monsoon, which arrived on June 1st at Kanniyakumari (the expected date) but then moved far more rapidly north than is normal, catching the pilgrims going to Kedarnath unawares. The finding and cremation of bodies continues – wood with which to cremate the dead is being taken in by helicopters which return with survivors. But here in the middle of Tamil Nadu we are anxiously awaiting the rain – at second hand. Apart from the odd shower, we don’t expect much rainfall on the plains until November, when the winds of the retreating monsoon pass over the Bay of Bengal, picking up new moisture, and depositing it to the east of the mountains. But our dams and tanks are thirsty for water. It is said that water which reaches the sea in rivers is wasted, so the Cauvery, the Vaigai, the Pannaiyar and the Palar are rivers of sand up to a mile wide and remain like that for most of the year. But there is a huge network of canals and irrigation channels which snake out over the land from large reservoirs at the foot of the hills. There has been rain in the Nilgiris, and I hear that the Kundah dam is filling up and they have been able to start power generation. 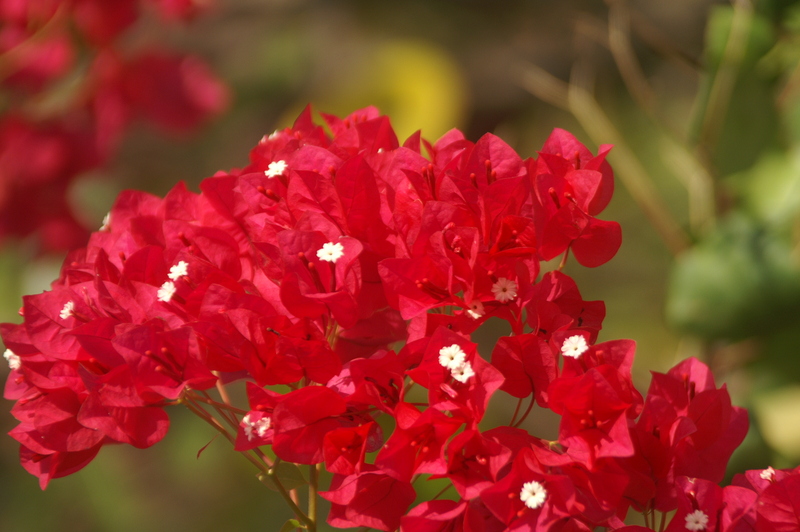 But around Kodaikanal there’s hardly been a drop. I walked up to the river this morning and it is a mere trickle among the stones. Nothing is reaching our dam, and soon the level will be below the lowest outlet and Dindigul will have to rely on water from deep borewells. 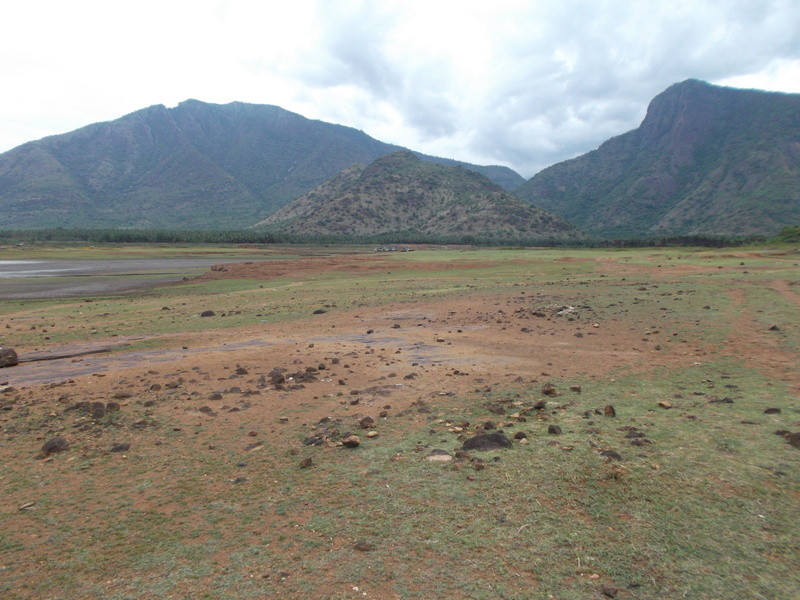 The lake can fill very quickly once the river starts flowing – our neighbour saw it rise one year by three feet overnight – but just at the moment we look out onto grassland and the local herdsmen are taking advantage of this and bringing in goats, sheep and cattle to graze. The other people taking advantage of the low water level are the sand and mud miners. Until yesterday, there were three diggers removing 6 feet of red sand – said to be excellent for brickmaking – which was going out in convoys of big lorries. Closer to the remaining damp patches, gangs of men were taking out dense black mud and loading it onto tractor trailers, destined for the plantations. River mud and sand is very fertile and much in demand, and there is a big “informal” economy around its extraction. 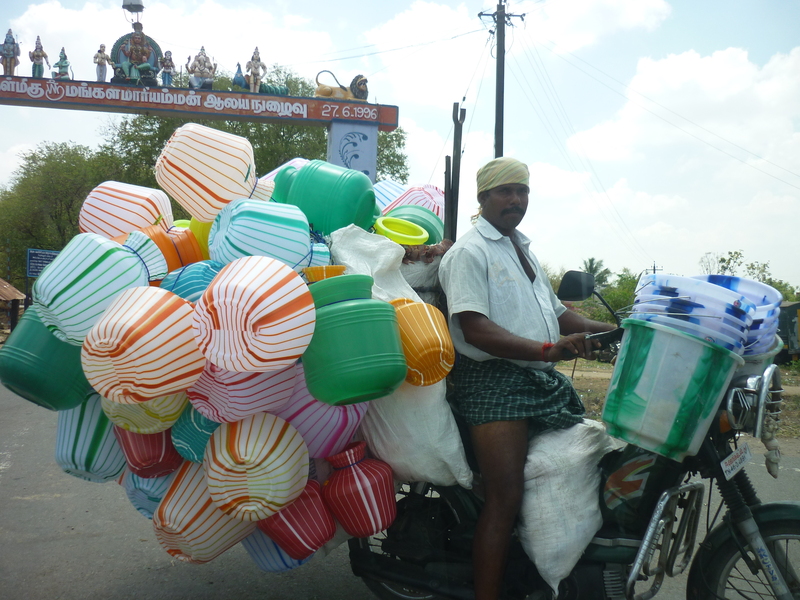 This entry was posted in Culture, Environment and tagged South India, Tamil Nadu on 14/07/2013 by Tailored Eco-Tours. The towns of the southern hill stations are tiny compared to those of the plains, and because the British authorities of the time were laying out a township in pretty much virgin territory, they seem to be more compact. 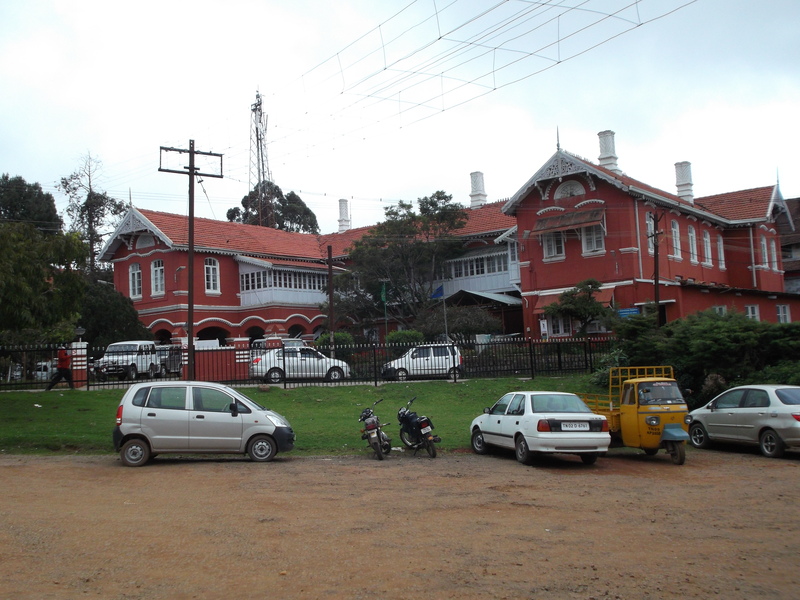 This is particularly true of Ooty, where the Collectorate sits in a cluster of old buildings just down the road from St Stephen’s church. St Stephen’s is a delightful light building, whose construction was quite controversial – the then Governor laid the foundation stone in 1829 and then seems to have shamed the Madras government into finding the money. 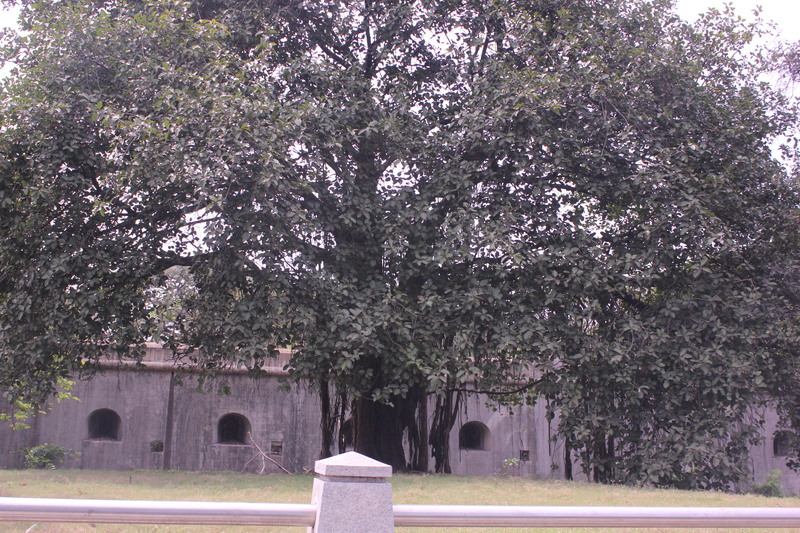 The great wooden beams for the interior were taken from the Tipu Sultan’s Lal Bagh Palace in Srirangapatnam, following his defeat in the great battle of 1799. Opposite are the colonial buildings, of brick and wood, put up 100 to 150 years ago and surviving remarkably well. 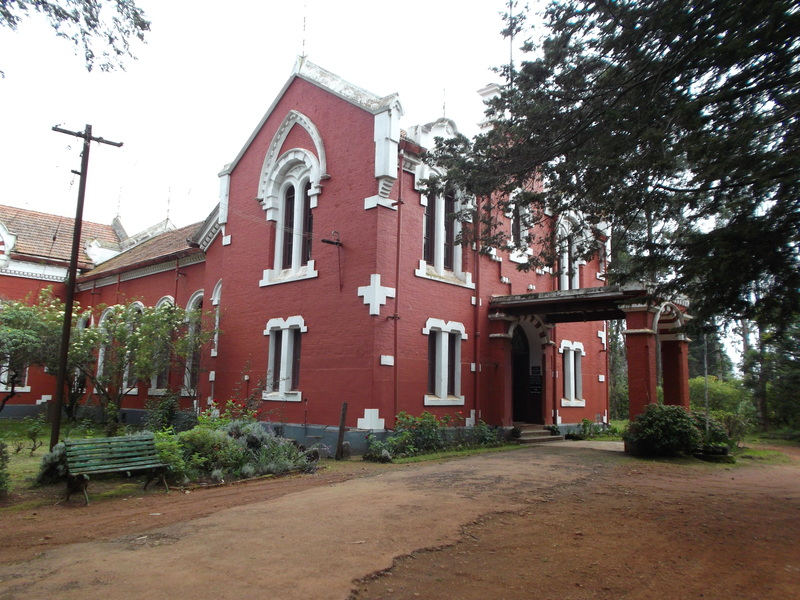 The Nilgiri Library has just celebrated its 150th anniversary with a makeover, and the Collectorate (or administrative HQ) is always spick and span. Higginbothams book shop has been freshly painted. The predominant colour for the bricks is red; and where there are wooden shutters (more usually found down in the plains) these tend to be green. The Madras Club’s new bamboo blinds, or chicks, are a splendid shade of green – it could be described as British Racing Green, but the paint shop in Dindigul knows it as “Country Club Green”! It all makes a refreshing change from the white concrete boxes of modern India. Concrete painted white is singularly unsuited to a tropical climate, as we found to our cost when we had to repaint our house in Chennai yearly. The whitewash, if you don’t watch the painters like a hawk, gets diluted 50/50 to make it go further, and at the first shower trickles down the walls and into the garden where it makes greasy grey puddles. 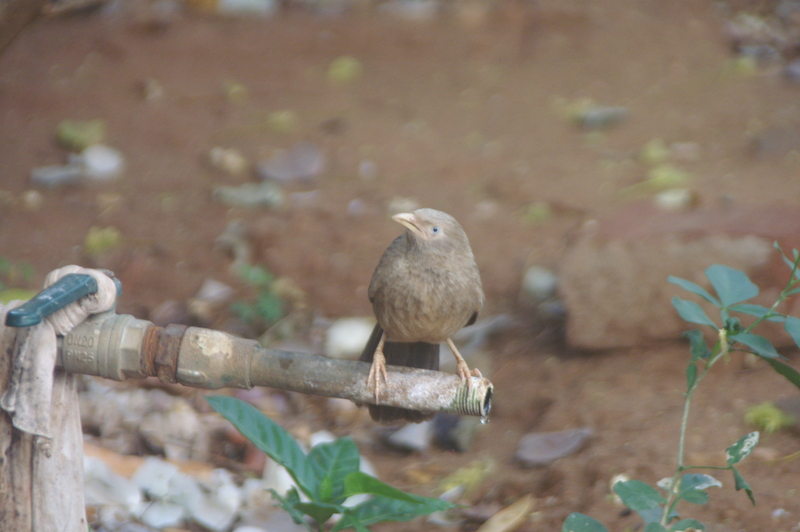 Even undiluted, it turns grey with mildew after the monsoon and the whole house looks quite unappealing. Perhaps the early painters knew something which is now forgotten. I have a theory (unproven) that maybe that particular red and green contained some element (lead? arsenic?) which was inimical to mould and mildew and kept the buildings looking fresh. Whatever the case, they are much more attractive than the modern ones. This entry was posted in Culture, travel and tagged South India, Tamil Nadu on 10/07/2013 by Tailored Eco-Tours. 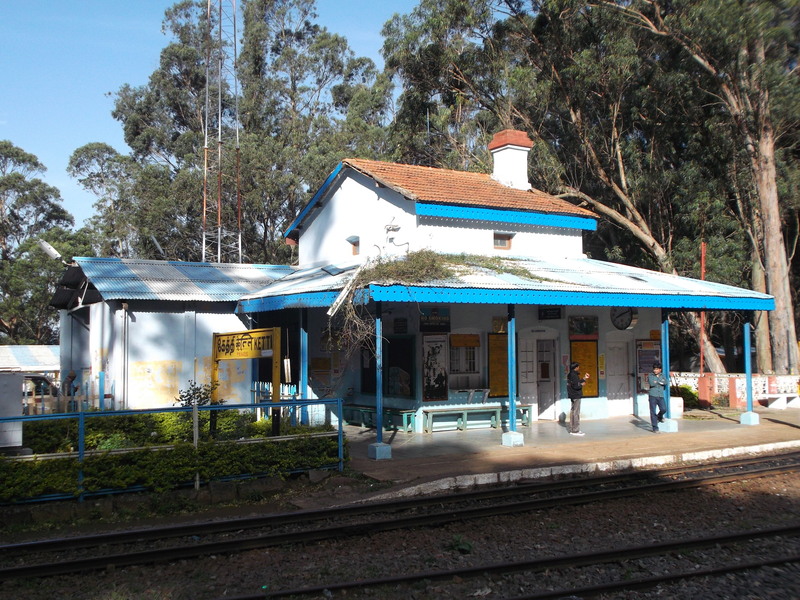 Arriving on the overnight Nilgiri Express from Chennai at the station of Mettupalayam, at the foot of the Nilgiris, you can – if you’re in a hurry – take a taxi up to Coonoor and then on to Ooty. It’ll take about an hour and a half – longer if you can persuade your taxi driver not to overtake on hairpin bends. The problem, of course, is that hairpin bends are much the easiest place to get past lorries: on a left-hand hairpin the lorry always goes onto the right-hand side to get round in one go and cars can slip through on the inside. Downwards traffic takes avoiding action. Everyone knows this is the system, and of course it works – most of the time! 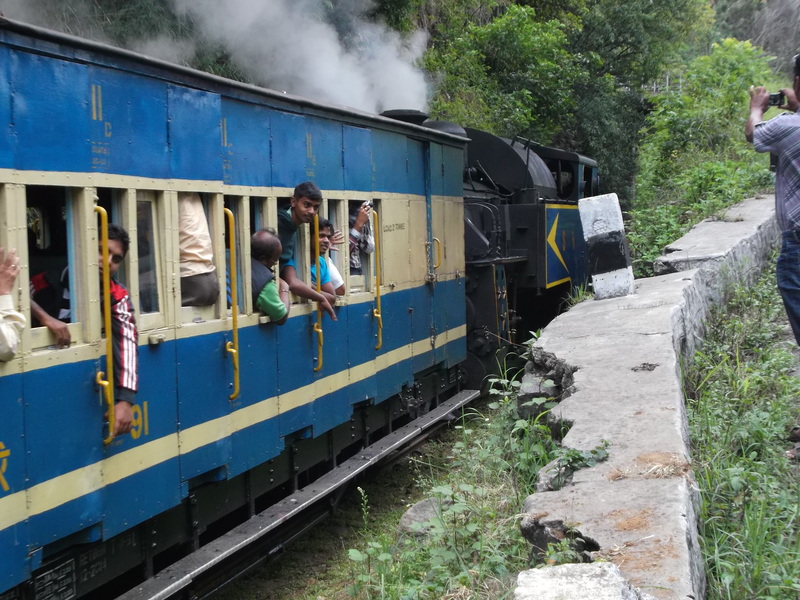 But if you are not in a hurry you can take the Nilgiri Mountain Railway, recently inscribed as a UNESCO world heritage site. The rack-and-pinion train leaves Mettupalayam just after 7am and reaches Coonoor a little more than three hours later. 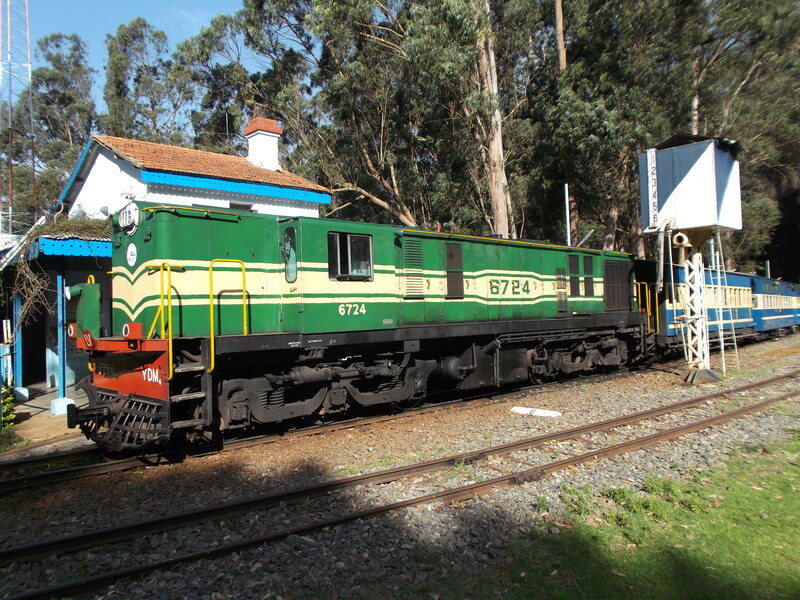 An ordinary diesel traction locomotive then takes the train on from Coonoor to Ooty in another hour and a half. The railway opened in 1899 with special coal-powered steam locomotives made in Switzerland. These have very recently been replaced by oil-powered steam locos made at the Golden Rock workshop in Trichy. The track from Mettupalayam to Coonoor climbs 1400 metres in 28km with a maximum gradient of 1 in 12 (the steepest in Asia) and a number of tunnels and bridges. In places the train is going so slowly that it is quite possible to get down and walk alongside for a while, and there are a number of stops to allow things to cool down. 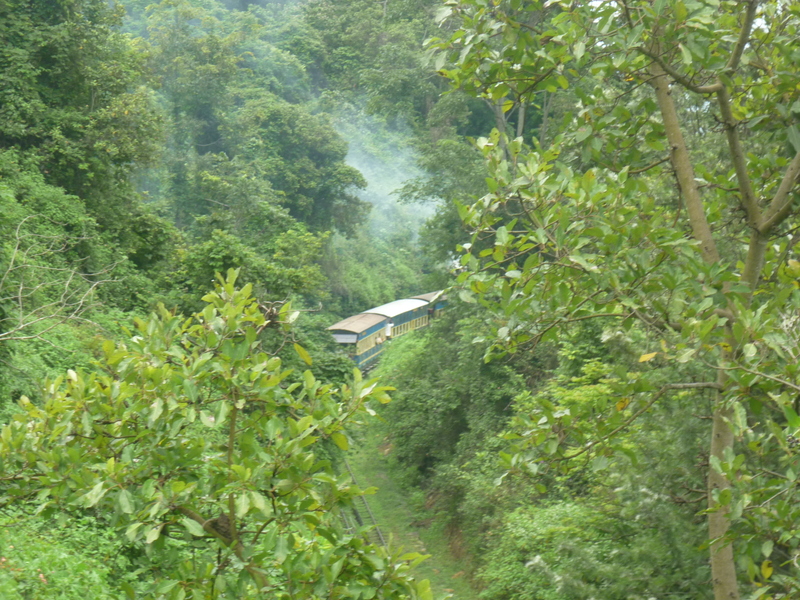 We recently went back to the Nilgiris and took a few photos of the train close to Hillgrove station, where it passes alongside the ghat road. From Coonoor to Ooty the track climbs another 500 metres, with stations at Wellington, for the Officer’s Academy; Aravankadu, for the Cordite Factory, then winding through the lovely Ketty valley (the other photos were taken at Ketty station) before reaching Lovedale, for the Lawrence School then passing through a final tunnel to run for a short while by the side of the lake then into Ooty station. 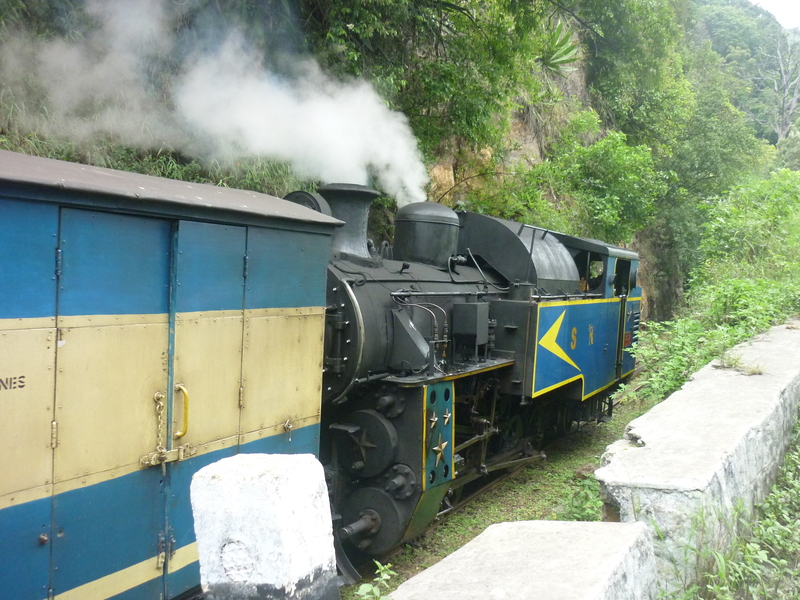 You may have seen the train in the film A Passage to India, where Coonoor station had a starring role. This entry was posted in Culture, Environment, travel and tagged South India, Tamil Nadu on 07/07/2013 by Tailored Eco-Tours. 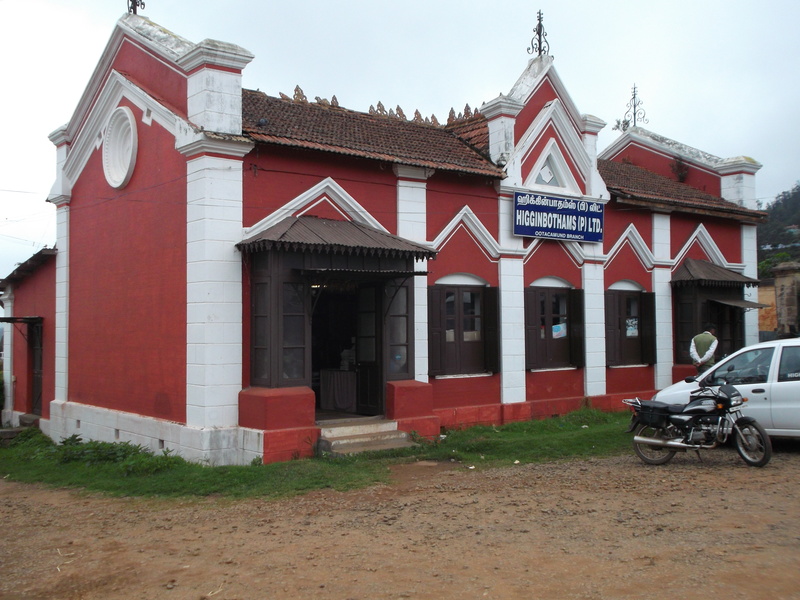 From its founding to the present day, Madras has been governed from the Fort. There was attempt a few years ago to build a brand new Secretariat building on a large site close by, but that fell foul of political wrangling and the building is now to be a hospital instead. 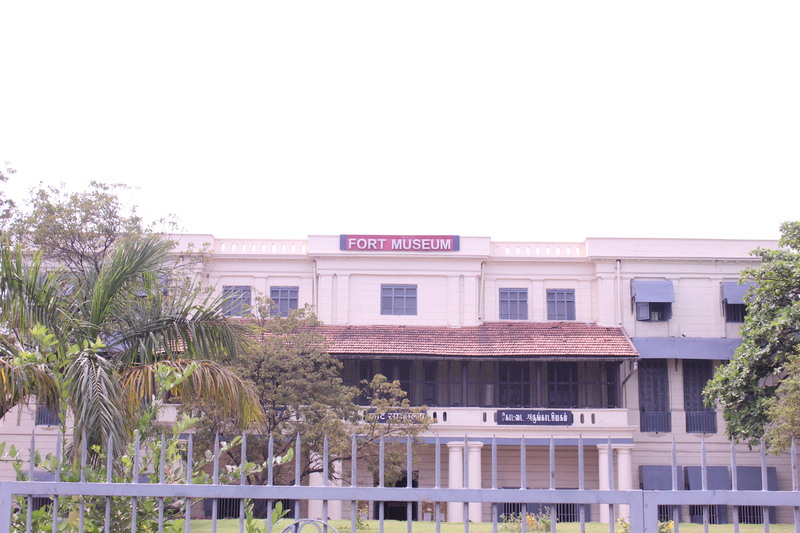 So the Chief Minister’s office is still inside Fort St George, built by the British East India Company and opened on St George’s Day, 1644. 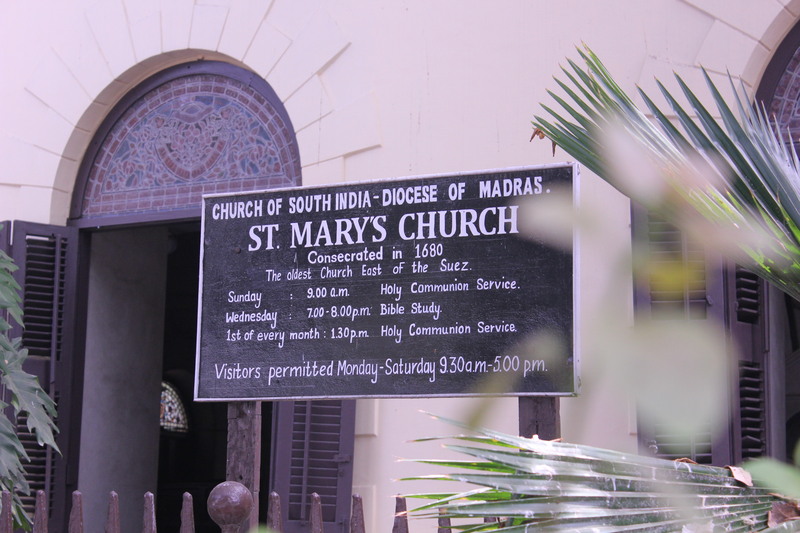 Along with offices from which the Madras Presidency was originally governed, and accommodation for the British officers and men, the Company built a church dedicated to St Mary. As was usual at the time, the engineer/architect was a military man, and the church has very thick walls so it can be used to store ammunition in times of crisis. St Mary’s describes itself as “the oldest church east of the Suez”. 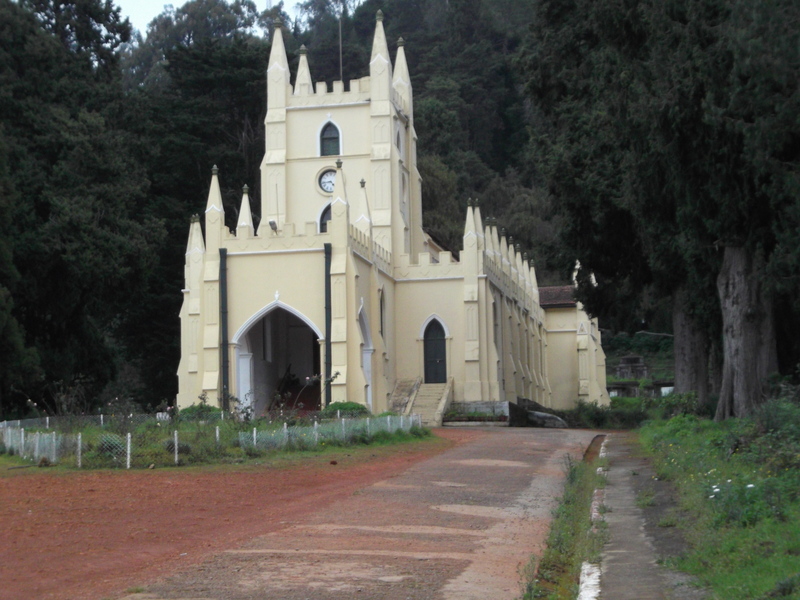 It was consecrated in 1680 and has been in continuous use since then by the Anglican community of the Church of South India. Inside is cool and surprisingly light; the floor is of large flagstones and the pews are dark wood. Many famous people are buried at St Mary’s, though as the site is cramped it is only the earliest tombs which are actually at the church. There is a large graveyard on the way to Egmore station which contains many more, including the Commonwealth War Grave. And the church register records names from history. In fact the first marriage to be recorded was that of Elihu Yale in 1680 itself. Yale went on to become the second Governor of Madras from 1687 to 1692 at which time he was relieved of his post due to excessive profiteering. Some of the profits later went to assist the new Collegiate School of Connecticut in the Colony of New Haven – Yale’s grandmother’s second husband was an early governor of New Haven – and that in due time became Yale College. Another famous name linked to St Mary’s is that of Robert Clive – “Clive of India” – who was married there in 1753 at the end of his first trip to India. He had just become renowned through his defence of the fort of Arcot with a few hundred men against several thousand troops of Chanda Sahib. Visiting St Mary’s is an atmospheric step back in time and can be combined with a visit to the Fort Museum. Photos are problematic at the moment since it is covered in scaffolding. This entry was posted in Culture and tagged South India, Tamil Nadu on 30/06/2013 by Tailored Eco-Tours.